partypoker prepared a new promotion for the players – Christmas Advent! Running from 1st – 25th December, players can simply open up our advent calendar window via the pop-up on our homepage and opt-in each day. All they have to do to earn their daily prize is to earn just one Cashback point through any poker game of their choice. 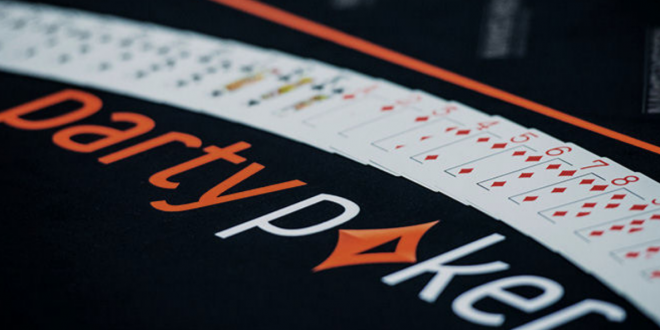 And look out for partypoker’s Christmas day bonus – an amazing tournament package, for free! With daily prizes on offer, players can enter into the festive spirit and won’t miss out on opening a window of our Advent Calendar! Join partypoker today and take free $22 in tournament tickets! GG Network introduced the Chinese Rush – a fast variant of NL Holdem. You can find these cash games in the lobby. From November 26, Chines Rush is visible in the client via its very own tab. Players will have 6 different blind levels to choose from, ranging from ¥0.1 / ¥0.2 to ¥5 / ¥10. Once the ‘Join’ button is clicked, players will be seated at random – no hassle, no fuss, just automatic seating. From then on Chinese Rush plays just like regular Hold’em, except that players will have the option to click on the ‘Quick Fold’ button. ‘Quick Fold’ instantly whisks you away to a very new table, full of new opponents. Think of ‘Quick Fold’ as a fast-forward option that allows you to watch the best parts of your favorite TV series, without having to sit through commercials and other filler. No more dozing off in between hands, no more zoning out, no more waiting for disconnected opponents. Just the most exciting parts of Hold’em strung together to make for a no-fat, no-filler, fast-paced and action-packed experience. ‘Chinese Rush’ will truly make you feel the Rush of Hold’em. Want to join the GG Network! Do it with us on Natural8 poker room, just click here and register! PokerStars prepared a promotion for the end of the year! All poker players will be able to win the Christmas Chests! From the 1st to 24th of December players will earn an additional chest called “Christmas Calendar Chest”. But that is not all! Those are the instant cash prizes that every player may get from the chests, but additionally, you can find a special “Christmas Key”. Three of those keys can be then exchanged for a cash prize up to $/€50,000! Plan your December to win that extra money! If you still don’t have a PokerStars account, register with us and take your First Deposit Bonus up to 600$! partypoker is back in Chezch Republic! As they announced, they got a license to operate in this country. They will do it with a partnership with King’s Resort! This way, partypoker becomes the only 2nd poker room which can operate in the country. If you still don’t have an account on partypoker, create it now! And to see which benefits are waiting for you, click here! Want to boost your bankroll for free? New Freeroll Series on Unibet launches on Dec 5th and it will be for YourPokerCash players exclusively! If you have signed up to Unibet with us, you will be able to take part in 10 tournaments. If however, you still don’t have an account on Unibet, you should register from our site. Tournaments will take place on 10 Wednesdays in a row, starting from Dec 5th. Every time, the tournament will start at 8 pm CET. To be more precise, you will have a chance to boost your bankroll for free with us on Dec 5th, Dec 12th, Dec 19th, Dec 26th, Jan 2nd, Jan 9th, Jan 16th, Jan 23rd, and Jan 30th. 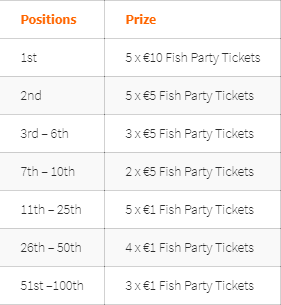 The Prize Pool for each freeroll will be €250. You can find tournaments in the lobby 7 days before the tournaments starts under the name: “Unibet Bankroll Booster Freeroll”. Registration opens 2 hours before the freeroll starts. If you have your Unibet account with YourPokerCash, contact us via mail with subject “UNIBET FREEROLL PASSWORD REQUEST”. If you don’t have an account with us, but you would like to participate in these freerolls, send us an email with the subject: “UNIBET RETAG” and in mail send us your Unibet screen name. We will check if you are eligible for retagging, and we will let you know in next 2 business days. Don’t forget about other benefits Unibet offers. New players should check for Better than Ever Unibet Welcome package and all other promotions you can find on our site in the full offer review. 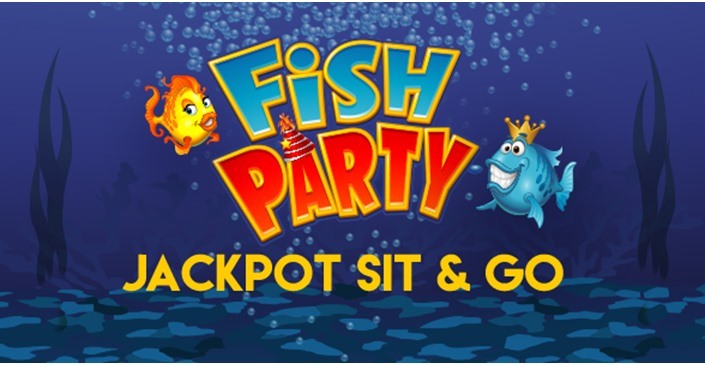 When you combine casino and poker you get unique Fish Party tournament. This is Sit & Go progressive jackpot tournament by Microgaming Poker Network, which is giving an ocean of opportunities to land the big one. It is similar to the PokerStars’s Spin & Go tournaments. Here, the main jackpot is progressive, not static as it is on PokerStars and many other networks. The buy-ins are €1, €5, €10, €20 and €50. 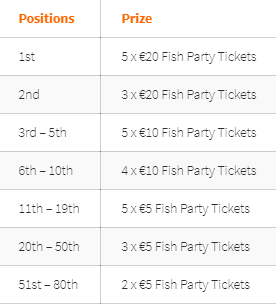 There is a great promotion running atm for this tournaments- Fish Party Challenge. You climb the leaderboards with every tournament you play. The higher on the leaderboard you are, the more tickets you will get. There will be three leaderboards according to the buy-ins. They will run for two weeks at a time. After each two-week cycle, the boards reset. The players who made it to the leaderboard will get their tickets and the next challenge begins. And of course, you can compete in all leaderboards. And below you can see 3 different leaderboards according to the buy-ins you prefer. You can check the leaderboards any time in the poker client under the My Account section. If you still don’t have an account on MPN, choose between some great options: Betsson Poker, Nordicbet or Betsafe Poker! You can see the full offer for each of these rooms on our site. Caribbean Poker Party $5.300Main Event came to an end. The winner is Portuguese player Filipe Oliveira. He managed to defeat a prize pool of total 1.815 entries. By winning this prestigious partypoker’s event, besides the Title, he won $1.5 million. 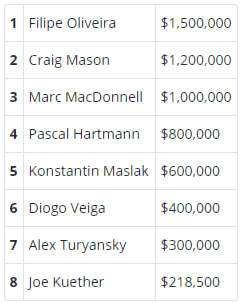 Oliveira’s previous career live tournament earnings were just over $100,000. The event ended up with an overlay of more than $900,000, giving away great extra value for the players. Just 11 players came into the final day and the players missing out on the official final table of eight were Niek Van Der Sluijs, Anton Wigg and Alex Lynskey. Oliveira entered the day in fifth chip position. 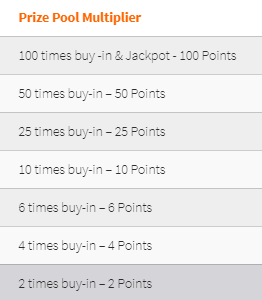 As we already said before, partypoker is constantly running great promotions for their players. If you are an SNG Jackpot lover, there are 3 great SNG Jackpot promotions for you at this moment. Win your seat for MILLIONS online! MILLIONS Online is getting closer, but you can still book your seat at the record-breaking $20M Gtd tournament through MILLIONS Online Sit & Go Jackpot! This $10 three-handed SNG’s offer you a fast track to online poker’s biggest ever event. Before a card is dealt, our multiplier will determine the size of the prize pool – you could play for a satellite ticket or even for the chance to win a $5,300 MILLIONS Online seat. Jump onto a MILLIONS Online Sit & Go Jackpot table now before it’s too late! The top prize of a $5,300 MILLIONS Online ticket. Win the tickets for KO Series! KO Series is on until 25th November, but you still have a chance to win your tickets by playing SNG Jackpots on partypoker. Win a ticket through KO Series SNG Jackpots and we’ll double your payout if you make the final table! Simply beat just two other players in these fast-paced $2.50 buy-in SNGs. Please note that if you win more than one ticket of the same value, only the first ticket qualifies for this promotion. So it’s possible to win five KO Series tickets – one for each buy-in level! Earn a $55 KO Series ticket by playing SNG Jackpots! Simply opt-in to Missions and send as many players to the rail as possible. Each knock out counts the same regardless of the stakes you are playing, so long as the buy-in is $5 or greater. Players can earn a maximum of one prize. All tickets will be paid out at the end of the promotional period, ready to use for the $10M+ GTD KO Series. 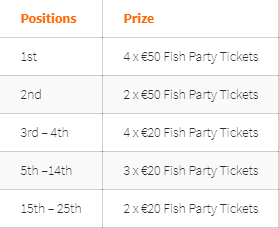 If you don’t have a partypoker account yet, click HERE to register, and take part in these great promotions! There is another great promotion by Betfair in November – Chace The Ace. Players who complete the Missions will win some great prizes. To participate in this promotion, players must opt-in via the poker software each day and choose between the Cash Game and Twister Mission. The promotion runs from 01. Nov 2018. 00:00 GMT until 30. Nov 2018. 23:59 GMT. Players have to choose either the Cash Game or Twister mission and complete the chosen one up to three times per day. It is not possible to mix and match, e.g. complete Cash twice and Twister once. After you win the prize, you will get it to your account automatically. For more details click HERE and under promotions section find all the instructions. Also, don’t forget to review the Betfair offer on our site and check many other promotions this room is offering.